Devi Kroell for Target from maybe 12 years ago. Looks just as great as when I bought it. 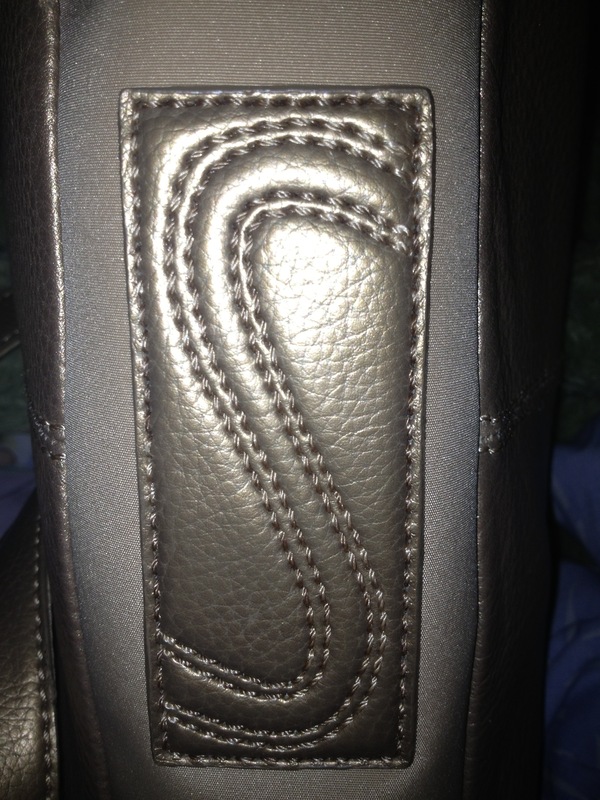 Hobo style, snakeskin pattern, fits well on my shoulder – an overall great bag. This entry was posted in target and tagged devi kroell for target, gold, Handbags and Purses, target on April 22, 2018 by miriamgmck. I have a few baggallini bags because they’re lightweight, well-made and often found at thrift stores. 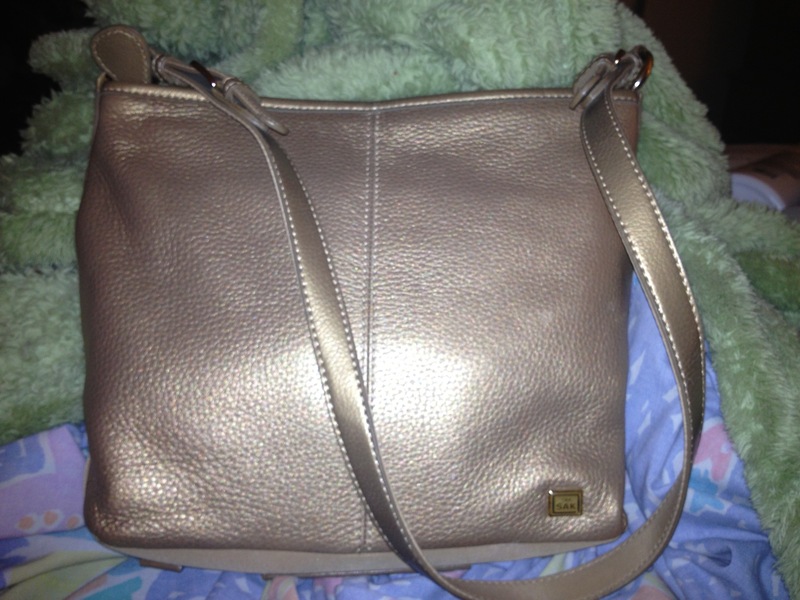 This one is a cute crossbody in gold that I’ve had for around five or six years. baggallini bags are great for travel and can be found in lots of different styles and colors at TJ Maxx. But why pay $15-$40 when you can find them at the thrift store for $4-$10? This entry was posted in thrifting, tj maxx and tagged baggallini, cross body, gold, thrifting, travel on April 21, 2018 by miriamgmck. This cute gold crossbody from the sak joined my Puma backpack today, which came in handy when it was time to go prom dress shopping with someone after work today. I found this at goodwill a couple of years ago. I like gold on a rainy day to bring a little faux sunshine into our lives. Find your way to bring sunshine to your rainy days. Red raincoats, yellow rain boots, and gold purses are how I do it. This entry was posted in thrifting and tagged crossbody, gold, goodwill, Leather, the sak, thrifting on April 3, 2018 by miriamgmck. Catching up on my giveaway – bag 21 is a vintage find. If you like animal print, check out this Brio! fabric bag with leather trim, cinched sides, velvet interior and gold hardware. Two thin leather straps will fit most arms. Almost said all arms but hey… realist here. This bag would go well with all black or a colorful outfit that needs that wow factor. Email me at 50favbags@gmail.com with bag 21 if you like it. Modeled by Kaia, and the flash nearly blinded her. This entry was posted in 2018 Lent bag giveaway, thrifting and tagged Animal print, Brio!, fabric bag, gold, hardware, leather trim on March 12, 2018 by miriamgmck. The Sak makes these nice cross body bags that are small but hold a lot of stuff. Gold is bold, perfect for a Monday. I’ll admit: I was leaving for my third errand of the day and couldn’t find my water bottle. I checked the car, the kitchen, living room, couldn’t find it. It was in the purse. Yes, that kind of day. Thank you for the perfect sized phone pouch on the back, large interior, with a zipper flap leading to another whole area. Yes i also have one in black. Thank you, Goodwill – got it for $6. This entry was posted in thrifting and tagged crossbody, gold, goodwill, Leather, the sak on April 17, 2017 by miriamgmck. My angel babe finishes out this year’s bag giveaway with a Loeffler Randall for Target faux leather bag. What a gorgeous bag, inside and out. Lined with gold fabric, this bag is both structured and relaxed. I usually rock this in the autumn and winter months. If this bag speaks to you, email me at 50favbags@gmail.com. Here ends the bag giveaway. I’ve enjoyed the thrills and challenges of this process. I can definitely say that my buying habits have changed. I leave many, many more bags in the store that i would have purchased in the past. That might not bode well for future giveaways, but it bodes well for my clutter, consumption, and wallet. Tomorrow begins 50 favorite bags, where I carry a different bag each day of Easter from my not-so-massive-anymore collection. That process presents its own set of fun and challenges – like not quite getting everything out of a bag and having to retrace my bag steps to find that receipt, appointment slip, nail clipper… first world problems. I wish you all a blessed Easter, if you celebrate. Whether you do or don’t, I wish you peace. This entry was posted in 2017 Lent bag giveaway, target and tagged burgundy, dressy, gold, Loeffler Randall for Target, shiny on April 15, 2017 by miriamgmck.